Today’s strip was fun~ I think mostly because I finished on time for once. XD Huzzah! What else, what else? Oh yeah – I’ve now made it through the fifth and sixth Elm Street movies. Five was pretty bad (Greta’s death = just disgusting) and its only saving grace was I like Alice (the main girl.) The sixth movie just went the way of Gremlins’ 2 and if this isn’t a flat out comedy I don’t know what it was. XD But it made me laugh so it’s all good. I have a feeling that either Wiglaf will willingly give them the orb, for some reason yet unknown, or there’s absolutely no way they can get it. Gawain and Hagen may get to bond some more during their reconnaissance. That should be interesting. If they want the Orb, they’ll have to get it before Wiglaf since Wiglaf could just throw them up in the air effortlessly. Something tells me they’ll be gone a lot longer if they have to find an entirely new magic object of equal value. Happy Easter! I don’t celebrate it, really, but coloring eggs is always fun. :P Yay, update, on time, I think? All I know about the update schedule is that it updates every…other…day? Good to see your up. Have a good Easter service or two. I think it’s the hips and the smile on the last panel that make Arthur look especially Janus-y today xD I like that shirt on him though. And yay for Hagen-Gawain hijinks! Theory: Gawain actually has quite a lot of money, since he doesn’t have to worry about medical bills or food. The problem is, every time he gets shot in the head, he’s likely to forget his pin number or the fact that his accounts exist. And because he has probably forgotten where his birth certificate is, his death certificate is useless, and they don’t issue driver’s IDs to dead people, he’s had to wait to get his employee identification (and subsequent villainous forged records to explain his existence) in order to start all over again. This explains his current worry over the money rather than the pain: he’s working on maintaining his account minimum right now, given all the cleaning supplies he just had to compensate the Garrotts for using to clean up the Mess that (ostensibly) he forced Arthur Sr. to create in the lobby. I’ve just realized that Sedrick has been getting slimmer in the waist since his creation. Way to go, Sedrick! Whatever regimen you’re following is paying off in spades. 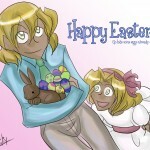 Happy Easter, Liliy! And that’s a perfect quote for the content of the comic. I love that Arthur’s so single minded that he doesn’t even notice the staff he’s sending are being told to steal off of his beloved brother. With Sedrick, loyalty to the Garrott family means never passing up an opportunity to profit from their misadventures. Sedrick is a horrible horrible perso- ahhhhh!! Sedrick! Whats with the knife and the baseball bat…. oh god no im to young to die :shocked: !!!!!!!AHHH-GUBLERETHIFD!! 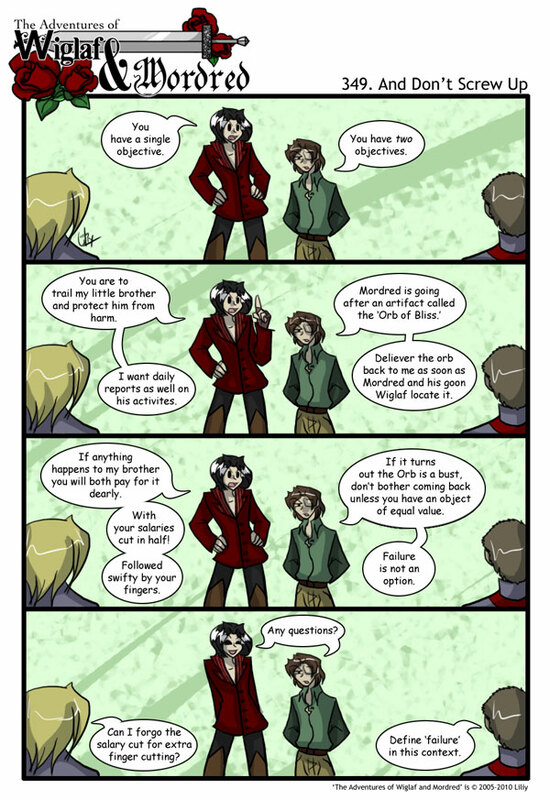 Does Arthur just not care if people steal from Mordred as long as Mordred doesn’t get hurt? XD Sedrick is standing right there going “Oh, and while you’re at it, find this object that his precious Mordred is after and pluck it from his hands.” Arthur doesn’t seem to notice.